Last year Cornell University’s Fab@Home program gave us a 3-D printer (read the post here) that uses syringes to make any 3-D shape you like –out of any paste you like. 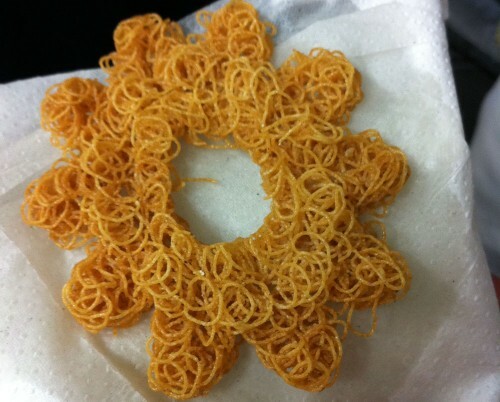 Fab@Home asked me to find a great application for 3-D printing food. Last week, I finally did. Our printer was broken (long story). I had come up with zero applications worth talking about. Jeffrey Lipton, currently the leader of the Fab@Home project, solved problem 1 by showing up with a new printer. Problem 2 was the tricky part. CNN was hoping for a story about how great it will be when, in the near future, we come home, press a button, and have machine print out dinner for us. I find that whole idea, which removes ourselves even further from the way our food is made, horrifying. Dinner from a series of homogeneous pastes? 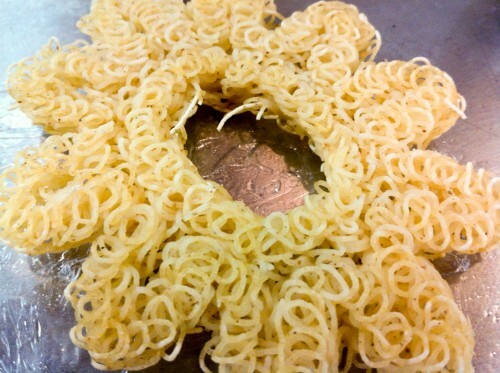 I needed a food idea that really warranted using a 3-D printer. 3-D food printing has a pretty big limitation: its raw material must be homogeneous and must be a paste, like cake icing — the printer extrudes products out of a moving syringe to create 3-D shapes. What can you do with paste? For kids’ birthday parties, say, you can print out the guest’s faces onto cupcakes. Whole businesses could be built around such cupcakes, but that isn’t the kind of application I care about. What does it matter if my homogeneous meat-paste is shaped like a turkey, or a car, or a penguin? Furthermore, if I were inclined to make meat-paste penguins, I’d probably need a whole bunch of them, so I’d make a silicone multi-penguin mold instead of 3-D printing them — molding is much more efficient for production runs than printing. Jeffrey and I had a brainstorming session. I told him I was hoping to use the printer to create a custom texture instead of a custom shape. He showed me a picture of an object he had printed out of silicone caulk that looked like the nappy part of Velcro. “Whaddya think of that?” he said. I liked it a lot – there were possibilities here. “It’s a technique I developed called stochastic printing,” he said. Stochastic wha? Masa is dough made from corn that has been nixtamalized (treated with calcium hydroxide). Corn tortillas, tamales, tlacoyos and the like are all made from masa. It’s a wonder-dough. Unlike like normal cornmeal dough, masa isn’t sticky; but sticks to itself quite well –it is cohesive. Unlike wheat dough, which is stretchy, masa isn’t elastic at all –it holds the shape you give it. Masa is a homogeneous paste. Masa is delicious. It is the ideal printing medium. I had a feeling that the taste and texture of steamed and fried squiggle printed masa would be fantastic. I was right. Stochastic masa block printed, steamed, and fried. Yum. This block is somewhat dense. The first shape we printed was a fairly dense block about 1.75 inches on a side. It fried up great. 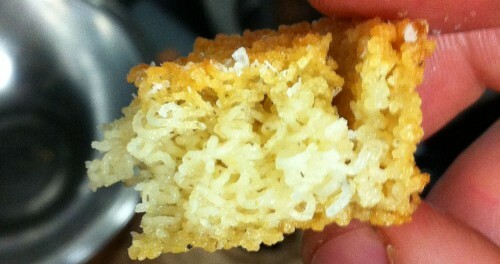 The inside didn’t get crunchy all the way through, but we liked it. Inside the first masa block. The ultimate masa crisp being steamed. We ate it so fast after it was fried that no camera was able to catch its deep-fried beauty. I could eat a bajillion of those. The next step is figuring out how to produce a bajillion. I’m quite saddened that you didn’t plug in masa fractals. I’m not quite sure if anything would be more delicious than a deep fried masa sierpinski triangles. You could also use chocolate compound coating, or tempered chocolate if you stick the entire machine at in a appropriately temperatured chamber to keep the chocolate from cooling too quickly. Regarding the food car, if you had inedible wheels or some other inedible piece, but everything else edible, you could use magnetic fields to propel the car around. I’m thinking give everyone a food car with an iron hood ornament and a few curiously strong magnet “wands”. Or maybe a candy food boat floating in a pool of delicious liquid. I love a fractal as well. I can’t give up on making the thing totally edible. A solution to a problem no one knew we had. Looks terrific, did you print on some avocado after the deep fry? I didn’t, but a non-chunky guacamole would print just fine! 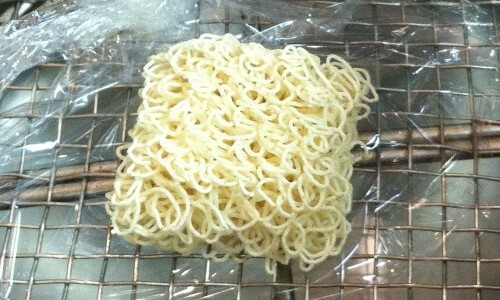 the last pic looks quite a bit like a block of instant ramen. it would be fun to pair them with little foil spice packets. Is anyone going to try to build a food specific printer? With lower accuracy and larger nozzles – and possibly parallel nozzles – you might be able to get good enough print times. Steve, you had me at larger nozzles. great to finally hear of a productive use for this beast! Last time you wrote about it I proposed making Swabian maultaschen from it. But your idea to use masa instead of sticky pasta dough is of course ingenious! How bout a fusion of them two, a masa block filled with finely cuttered sausage meat inside? You could either random sqirt it in there, intermixing them two strands, or you could simply spoon a blob of it (or any other filling)into the 3d structure, like make a small basket fill in and then squirt a lid on top…. Mashed potatoes? If you could get mashed potatoes to be the same consistency as masa I bet you could get wonderfully crispy delicious fried potato goodies out of this! Candy-shelling them in chocolate and then dipping in a lot of these would also be pretty rad. I particularly would like to try one shelled in chocolate and dipped in a thickened balsamic vinaigrette. I know they’re working on making 3d printers that print multiple substances. I bet it wouldn’t be too hard to throw some extra syringes on there, which would open up more possibilities. Although I have the feeling this has already been mentioned more than thrice. For some reason I thought of rice crispy treats while watching the video. Use it to pipe out already cooked and pureed food stuffs with a stabilizer? Howdy J BF! I need to fire up the printer again. Been too busy. It seems like you could use whatever process cheap ramen manufacturers use to make their ramen blocks to mass-produce something with this texture. In essence that is what they do, but they don’t have as much control over the texture as I’d like. In principle, I agree that a multihead simultaneous extruder is necessary. Regular tortilla chips are made from masa. My interest in this area of 3D printed edibles is the potential to create special celebratory delicacies where the added value is delicious personalised presents. After Fabbaloo covered your work in January I wrote about these exciting developments and used our haptic software to design chocolates (see here http://www.anarkikangels.co.uk/index.php/3d-printed-edibles/). The reason for contacting you is the connection between how and why we developed our software and the needs of creative persons wanting to use 3D technologies. Creative people don’t want to spend valuable making, experimenting and doing time with having to learn a complex 3D modelling package (e.g. CAD). So we tapped into 3D haptic (3D virtual touch) technology as a familiar interface to interact and model in 3D as we all know how to interact in the real world with objects through our sense of touch and proprioception. The result is a package that is very intuitive, easy and quick to learn and use, and what is learnt is easy to retain until the next session. It marries how we as craftsmen work and create with the advantages of digital and virtual i.e. risk free environment to which we can bring our knowledge and expertise to explore and experiment to ultimately make something tangible. I am a designer maker, a jeweller and I use 3D printing and the printed pieces as the final work, taking advantage of being able to personalising each piece within a series to keep them affordable. Masa is one of my favorite ingredients. This is very intriguing work you have done. I see it sitting in the center of a good sauce. Perhaps with mushrooms or spinach, and of course, cheese. I’ve been working on the perfect masa dumpling. Not there yet but some good progress. I’d like to see the dumpling.